FILE - The long-range ballistic Agni V missile is displayed during a Republic Day parade, in New Delhi, India , Jan. 26, 2013. India conducted the fifth test of its nuclear capable intercontinental ballistic missile on Thursday from the Abdul Kalam Island off Odhisa’s coast in the east. The country’s most advanced missile, the Agni V, has a range of more than 5,000 kilometers, and will bring all of China within range when it is inducted into the armed forces. "We have successfully launched nuclear capable ballistic missile Agni-V today,” Defense Minister Nirmala Sitharaman said. The Defense Ministry called the test a "major boost" to the country's defense capabilities. The 17.5-meter-long, surface-to-surface missile which has been domestically developed, is capable of carrying a nuclear warhead of about 1.5 tons and is crucial in India’s efforts to develop an effective nuclear deterrence, according to defense analysts. India is estimated to have about 120 to 150 nuclear warheads. “It becomes very obvious from the perspective that, yes, India has got two adversaries, Pakistan and China, and both of them are nuclear weapons state and both of them have missile capability. So you are developing a missile to ensure the strategic balance in the region is maintained,” said Ajay Lele at the Indian Institute of Defense Studies and Analyses in New Delhi. Tensions between India and China spiked last year when the two countries were involved in their most serious confrontation in decades along a strategic Himalayan plateau where India accused China of building a road that would make it easier to access its territory. Although troops from both sides stepped back after more than two months, the standoff has left India increasingly wary of China, with whom it has a long-running boundary dispute. However defense experts said the test was not linked to the spike in tensions, saying that the technology had long been under development. “One should look at it from that perspective, instead of putting too much onto India’s existing relations with its adversaries,” said Lele. 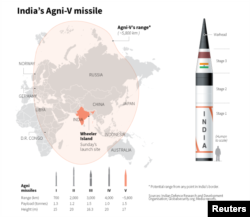 Besides adding muscle to India’s nuclear capability, the Agni V is also an intrinsic part of New Delhi’s aspirations to be viewed as a regional power. Only China, France, Russia the United States and Britain have long-range nuclear weapons. India is also spending billions of dollars to upgrade its weapons and modernize its military. However inducting the Agni V missile into the armed forces could still take time. Thursday’s test was described as a user test and analysts say at least one more test is likely before the missile is fully operational. Agni means fire in Hindi and Sanskrit, and earlier generations of the missile are capable of targeting Pakistan and some parts of China.